Something peculiar is happening in the azure waters off the rocky cliffs of Ischia, Italy. There, streams of gas-filled volcanic bubbles rising up to the surface are radically changing life around them by making seawater acidic. Stanford researchers studying species living near these gassy vents have learned what it takes to survive in acidic waters, providing a glimpse of what future oceans might look like as they grow more acidic. Their findings, published December 11 in Nature Communications, suggest that ocean acidification driven by human-caused carbon dioxide emissions could have a larger impact than previously thought. "When an organism's environment becomes more acidic, it can dramatically impact not only that species, but the overall ecosystem's resilience, function and stability," said Stanford marine biologist Fiorenza Micheli, lead author on the paper. "These transformations ultimately impact people, especially our food chains." 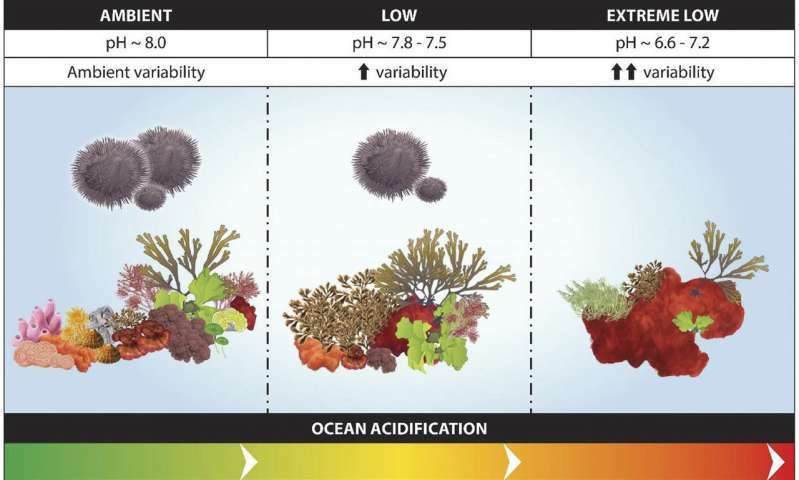 Most ocean acidification studies to date have taken place in laboratories, making it impossible to assess how whole ecosystems comprised of multiple, interacting species would be affected. The real-life laboratory provided researchers an opportunity to examine dozens of species, from sea urchins to marine snails, that live in areas of different acidity along Ischia's volcanic carbon dioxide vents. In addition to studying how species diversity changed with acidification, they analyzed species traits, such as diet and growth, that influence how well the ecosystem performs. For example, sea snails were smaller in more acidic water, as their shells take longer to grow and are thinner and more brittle. These harmful effects on sea snails, a key food for animals higher up in the food chain, may affect fish populations. Overall, the researchers found that the active venting zones with the most acidic waters were home to not only the least number of species, but also the lowest amounts of "functional diversity" – the range of ecosystem-support services or roles that each species can provide. "Studying the natural carbon dioxide vents in Ischia allowed us to unravel which traits from different species, like snail shell strength, were more vulnerable to ocean acidification. 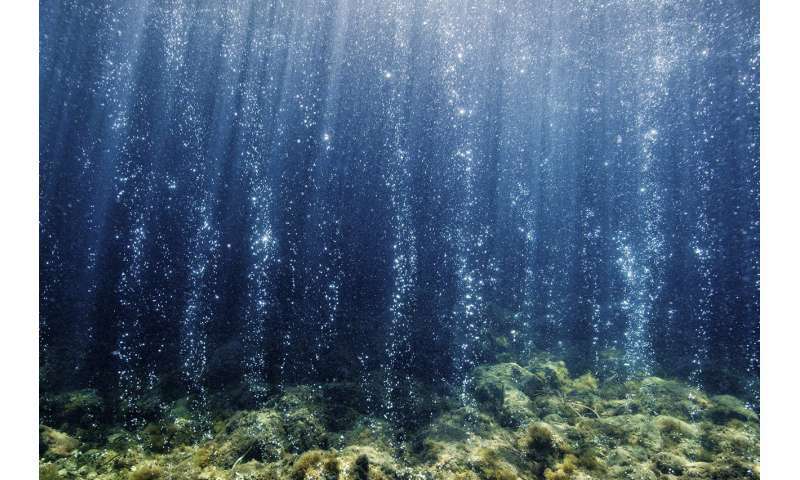 These results illuminate how oceans will function under different acidification scenarios in the future," said lead author Nuria Teixidó, a marine biologist from Stazione Zoologica Anton Dohrn in Italy, who was a visiting researcher at Stanford during the research. Acidification in the waters of Ischia displaced long-lived species, such as corals, that form habitat for other species – a process already often witnessed on reefs across the world. The researchers also found that high levels of carbon dioxide and more acidity favored species with short life spans and fast turnover as they are the only species that can resist these environmental conditions. This change could lead to further diversity loss and instability in the oceans, as biodiversity tends to increase an ecosystem's stability. "The effects of ocean acidification on whole ecosystems and their functioning are still poorly understood," said Micheli, a professor of biology. "In Ischia, we have gained new insights into what future oceans will look like and what key services, like food production and coastal production, will be lost when there is more carbon dioxide in the water."